PFN has seen a steady return since I recommended it last year. The fund continues to offer a high yield but trades at a more reasonable valuation than many PIMCO CEF alternatives. The high-yield debt market continues to look attractive, especially as the Fed has reiterated a dovish policy stance this year. The purpose of this article is to evaluate the PIMCO Income Strategy Fund II (PFN) as an investment option. While PFN has not soared to high premium levels like many PIMCO funds, I view this positively going forward. It is one of the few CEFs offered by PIMCO that is trading at a reasonable valuation, and its underlying performance is strong. Furthermore, PFN has a current yield and year-to-date performance that bests the majority of PIMCO CEFs at the moment, further compounding why the fund looks attractive on a relative basis. In addition, PFN's income production, while slipping, is enough to cover the stated distribution. Further, the fund was not part of the latest round of PIMCO distribution cuts, giving me confidence the high yield is safe for the time being. 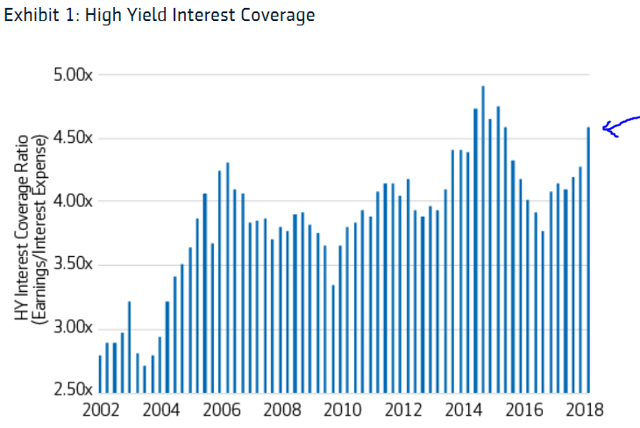 Finally, there are reasons to be optimistic on high yield credit, such as continued low interest rates and improving interest coverage within the sector, giving investors plenty of reasons to consider this investment option. First, a little about PFN. The fund's objective is "to seek high current income, consistent with the preservation of capital". The fund achieves this by investing in a wide variety of debt assets but will not invest more than 20% of its total assets in securities rated CCC/Caa or below (at time of purchase). PFN is currently trading at $10.43/share and pays a monthly dividend of $.08/share, which translates to an annual yield of 9.20%. I covered PFN back in July and recommended the fund primarily for its reasonable valuation and high income stream. Since that time, PFN has returned over 7%, after accounting for distributions. Now that quite a bit of time has passed, I wanted to reassess PFN to see if it still makes sense to hold going forward. I believe it does, and I will explain why in detail below. 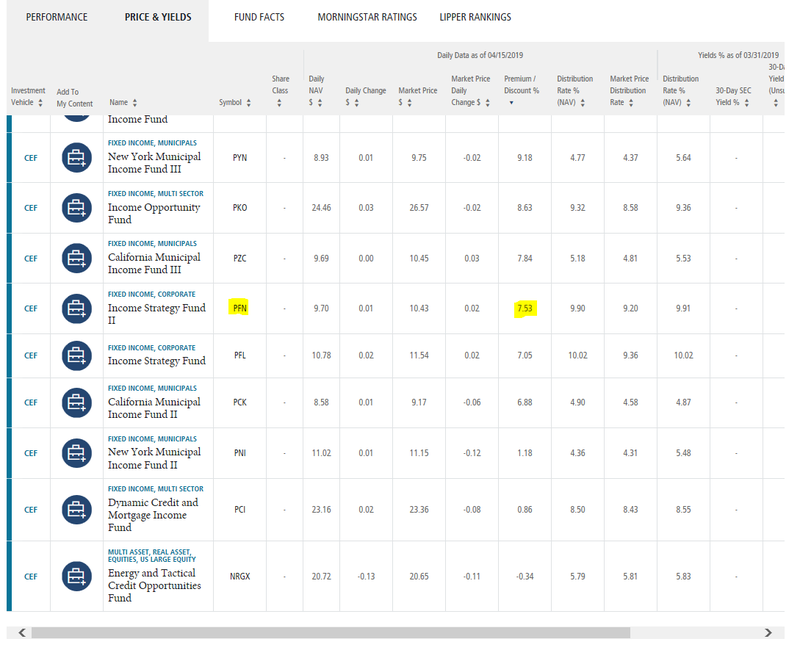 As you can see, only 3 PIMCO CEFs are in what I would consider "cheap" territory, but PFN still offers a comparable value. Of course, a lower premium is not necessarily a good thing if the fund is performing poorly and, therefore, warrants a cheaper price. Or perhaps the fund yields less than other PIMCO offerings, and therefore, it is less attractive to investors. 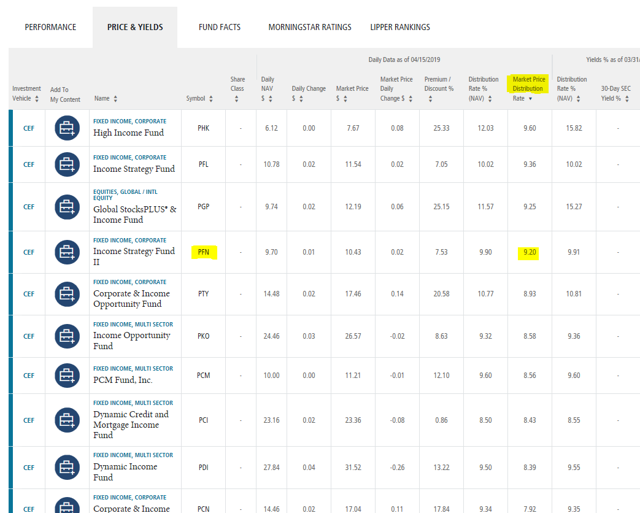 As you can see, PFN is only 1 of 4 funds in the 9% yield range, which is quite attractive, both on the surface and in comparison to the rest of the field. 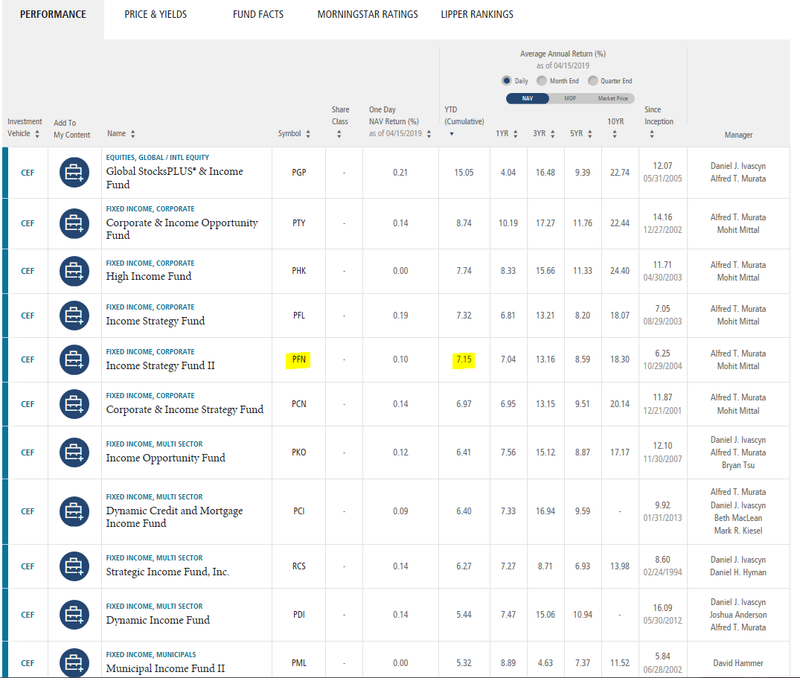 As you can see, even without seeing its premium rise to a double digit level (as with many PIMCO CEFs), PFN has still seen one of the best year-to-date returns, clocking in at over 7% since 2019 began. My takeaway here is that PFN is cheaper than the majority of the CEFs from PIMCO, yet its underlying characteristics do not seem to warrant that below average valuation. The fund is performing strongly, and its yield is better than the majority of other offerings. With this in mind, I see PFN's 7% premium as sustainable. I believe it offers investors continued value at these levels, in comparison to many PIMCO CEFs, which are getting to the point where I would not recommend them. My next focus is going to be on income production, which is of particular concern with any high-yield fund. While I always focus on this metric, it is especially timely because PIMCO announced distribution cuts to a number of funds at the beginning of April. I almost always view those cuts negatively, and it was a relief to see PFN was not impacted by the cuts. As you can see, these figures do not inspire a lot of confidence, especially since the UNII has been slipping consistently for the past few months. However, there are a few positive attributes in this overview. One, the fiscal year-to-date coverage ratio is strong, at over 94%. This figure, coupled with the, albeit small, positive UNII balance, tells me the distribution is not in danger at the moment. This is especially true since PIMCO just went through a round of cuts, and if management was truly concerned about PFN in particular, it likely would have been included in that round. Looking at PFN's history gives us another reason to remain confident in the current distribution. The fund has paid out the $.08/share distribution for almost seven consecutive years, since May of 2012, giving investors comfort in management's ability to maintain the income stream. Furthermore, PFN has seen strong underlying performance in 2019. In fact, the fund's NAV is up over 3.6% year-to-date, rising to $9.70/share from $9.36/share on 1/1/19. My point here is the fund has seen the value of its assets climb, which means it could sell assets, if needed, at a profit to make up for any shortfall in current income. While this is not an ideal scenario, it presents added cushion to the safety of the distribution for the time being. Clearly, this is an important sector when it comes to forecasting overall performance for PFN. Clearly, this is a positive sign, as it shows corporations at the lower end of the credit spectrum are seeing their financials improving. As long as this trend continues, defaults should remain low, which is good news for PFN. In light of global economic and financial developments and muted inflation pressures, the Committee will be patient as it determines what future adjustments to the target range for the federal funds rate may be appropriate to support these outcomes." The Fed's continued use of the word "patient" is important here, as many investors are now focused on seeing that language in any policy announcement. When this language is removed, we could read that as a sign that an increase may be coming in the short-term, but until then, investors can take some comfort in knowing the next move is not likely to happen soon. 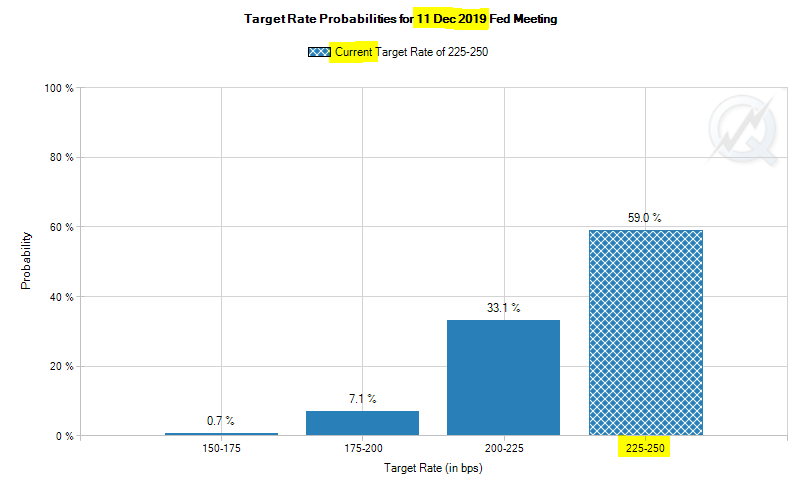 As you can see, investors are taking the Fed's dovish stance to heart, and are actually giving fairly strong odds (41%) of an interest rate cut by year-end. 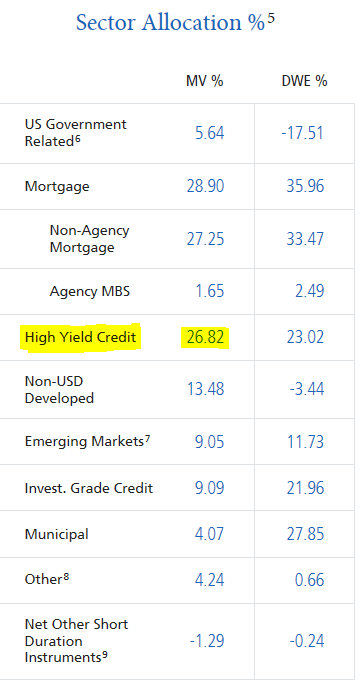 My takeaway here is this is positive for high yield as a whole. Low interest rates will keep investors interested in higher yielding sectors, which should fuel continued demand in funds like PFN. Furthermore, low interest rates also put less pressure on corporation's ability to finance operations, which will help keep defaults low, as we have seen over the past decade. Add this all up, and the short-term outlook for PFN is bright indeed. PFN is a steady, reliable fund, and this trend has continued in 2019. While it does trade at a premium price, the premium is actually quite reasonable, especially when evaluating it against other PIMCO CEFs. Furthermore, the steady nature of the fund means it has not seen a massive share price rise, which allows new investors to buy now and still capture a yield in excess of 9%. While income production has declined in the short-term, I have faith in PFN's ability to continue to pay its current distribution, especially considering the fund was not impacted by the distribution cuts earlier this month. Finally, high yield debt remains attractive, with improving corporate financial conditions and a continued low interest rate environment. Therefore, I continue to view PFN favorably and would recommend investors give this fund some serious consideration at this time.